Tangible modular synthesis in Reactable’s ROTOR. The original Reactable is an electronic instrument which lets you patch together modules such as VCOs, sequencers, samplers and effects by positioning colourful blocks on an illuminated tabletop surface. These components are automatically connected up by animated cables depending on their proximity to one another, and parameters can be controlled by rotating the blocks. It’s an intriguing concept, and its potential as a performance instrument has been picked up by artists including Björk and Coldplay. The company first offered the Reactable experience in tablet form with Reactable Mobile (SOS July 2012). They’ve now followed this up with ROTOR, which offers an improved UI along with additional functionality and physical controllers. Opening ROTOR shows an immediate improvement over the previous app, the interface having been revamped with a clean, stylish appearance and optimised for live performance. The various modules are listed in a compact sidebar which keeps everything at your fingertips, and they can be swiped from here into the main construction area or ‘table’. They can then be dragged, turned and tweaked in various ways, and double-tapping then opens a configuration window. The interface is engaging to look at, the virtual cables showing an indication of the data or waveforms that are flowing through them. These can be cut and reconnected by swiping across them, providing a simple way to drop parts of the musical arrangement in and out. The table has a global tempo indicated by a pulsing graphic, and time-stretching algorithms are applied to keep loops and sequences in sync. ROTOR also introduces a novel ‘Tonalizer’, which can analyse musical content and make automatic adjustments to keep things in the same key. The building blocks fall into various categories such as generators, controllers and effects, and these have also received numerous updates and improvements. There’s now full MIDI support as well as Ableton Link, and new effects including Beat Repeat. The Help system has had a substantial boost, with a lengthy manual available online or within the app. A selection of demo tables has been included to illustrate different concepts, and you can choose to display a description of any selected component. Reactable have also bolstered the built-in content, with over 100 loops available to kick-start your compositions. A neat innovation with this app is the availability of its own dedicated physical controllers; small 2cm cylinders or ‘pucks’, which can be used in place of fingers to manipulate the position and settings of the various modules. The original Reactable Mobile had a well-integrated community aspect, allowing you to dive online to download tables created by other users. This link is absent in ROTOR, and the interoperability between the two systems isn’t immediately clear, though Reactable Mobile remains available for separate purchase if you want to explore this content. The new app demands faster hardware, and you’ll need at least an iPad Air, Mini 2 or iPhone 4S. The physical controllers aren’t designed for use with the iPad Pro, but a suitable set is due for release shortly. 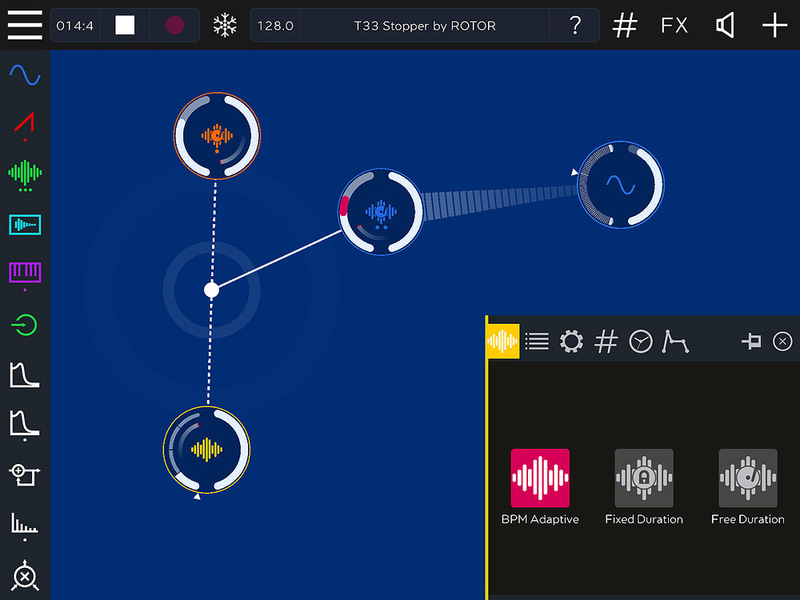 There’s a lot to explore in ROTOR, an imaginative app aimed squarely at live performance. And the UI is nice enough that if you picked up a couple of pucks and got your iPad display projected onto a screen, you could have a touch of that magical Reactable action at a very reasonable price. £7.99, set of two controllers £34. $9.99, set of two controllers €39.90.